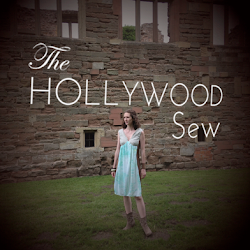 Once you've checked that out, head on over to New Vintage Lady's blog because she's having a Make and Mend sew-along! This is basically her list of projects she hopes to accomplish, and I hope to as well! Looking at this, I think I can do it. Mostly. I'm going to have two crafts made from scrap fabric done soon. Reworking a garment is on my list of things to do. Making an item for someone else is also on my list of things to finish this week. The two wearable items not meant for daywear might be difficult to pull off. I was planning on making yoga pants, but that's on my won't-happen-anytime-soon list. Not sure what the other one might be. Maybe a slip or some lingerie? Also the embellishing one might be hard since I tend to make everything with zero frills. It also might be difficult because I have no idea what those examples listed actually are. Faggoting? Pin tucking? More research is needed, clearly. Also, I don't know if I can do it without buying new fabric. Actually, the only thing I might need to buy fabric for is the slip/lingerie if I decide to go that route. I have enough in my stash for everything, and isn't the point of making do and mending to re-use what you've already got? Sounds like my kinda sew-along. 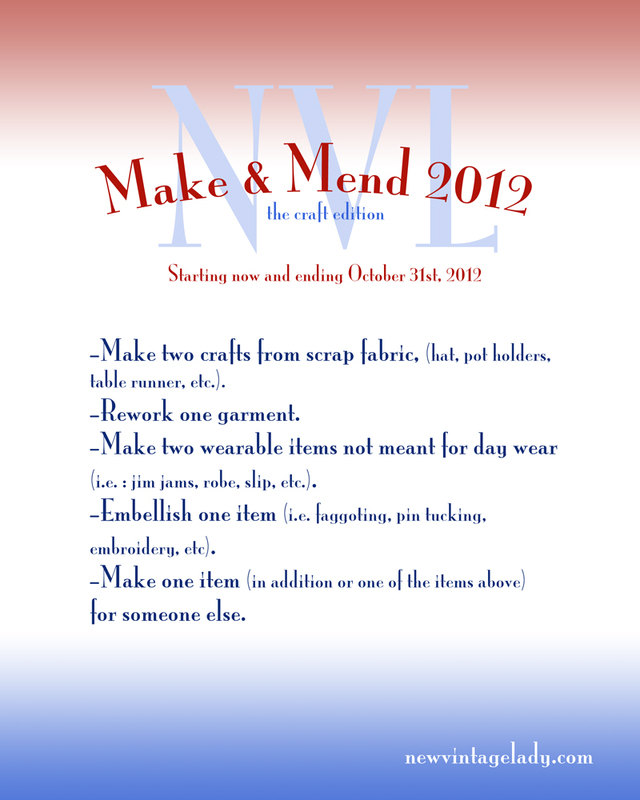 Already planning some make do and mending for the pattern review refashioning contest. (Turning strappy Maxidress into short daywear dress with sleeves.) Was originally going for making stuff out of pillowcases but couldn't find enough matching ones. Already made a huswife from fabric scraps and a crazy patchwork sampler I made using old scraps. 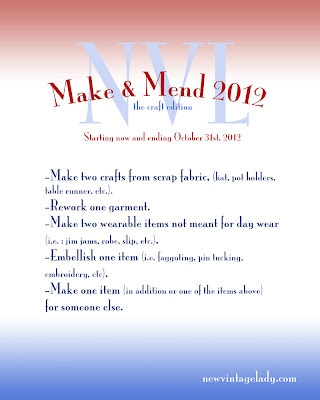 As for making a slip you could thrift some material? Embellishment I'd do some embroidery on a cardigan or shirt collar. Only bit I'd struggle with is making something for someone else.